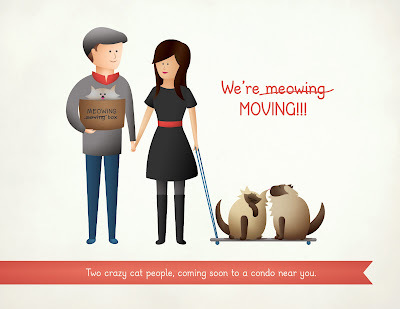 In the words of the great Phoebe, Let's live in an apartment that we both live in! It's with giddy pleasure that I announce that after much searching, Mitch and I have purchased a condo — okay, Mitch has purchased a condo and promises to let me live there. Nice, right! Moving to the ever blossoming Lower Lonsdale region of North Vancouver; our sweet suite is wonderfully south-facing, has great big windows, and an open kitchen. After much searching, bidding, and some light renovating; the place should be move-in ready by the weekend! Eek, homeowners? I mean, whoo, homeowners! Also, no more painting, please. Artwork copyright © 2011 Jasmine Habart. 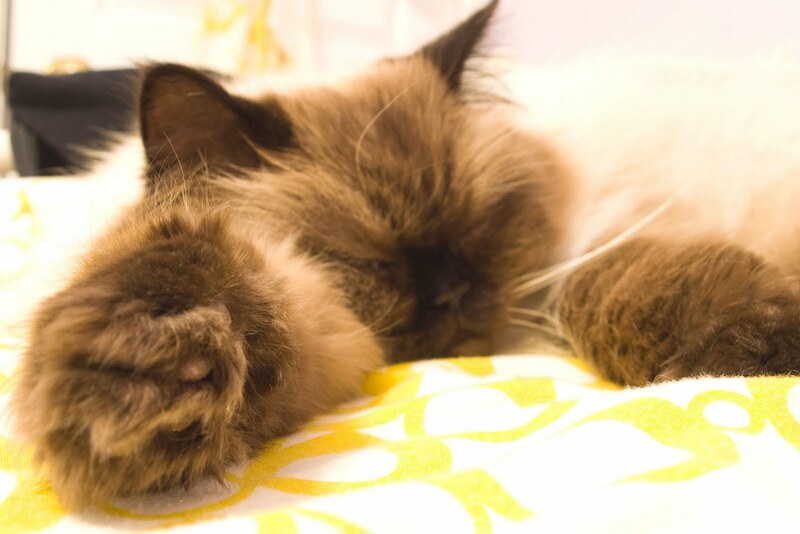 This image is in response to yesterday's blog post on one of my favourite feel-good websites, My Himalayan Cat Goma. Goma looks like Gus, but he's even fluffier!! Yesterday's post was titled, Cat in a basket—How to Choose a puurfect basket for your cat. 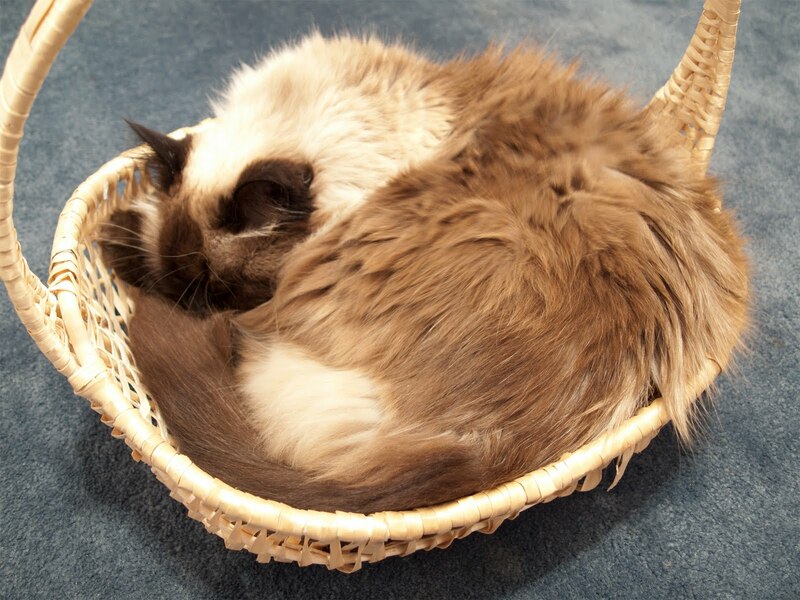 Well, Gus isn't really one to surrender to the confines of a basket. Mickey, on the other hand, can usually be found curled up in this one anytime between the hours of 7pm and 2am, at which point he usually decides it's time jump on my face and eat my hair. What a guy. 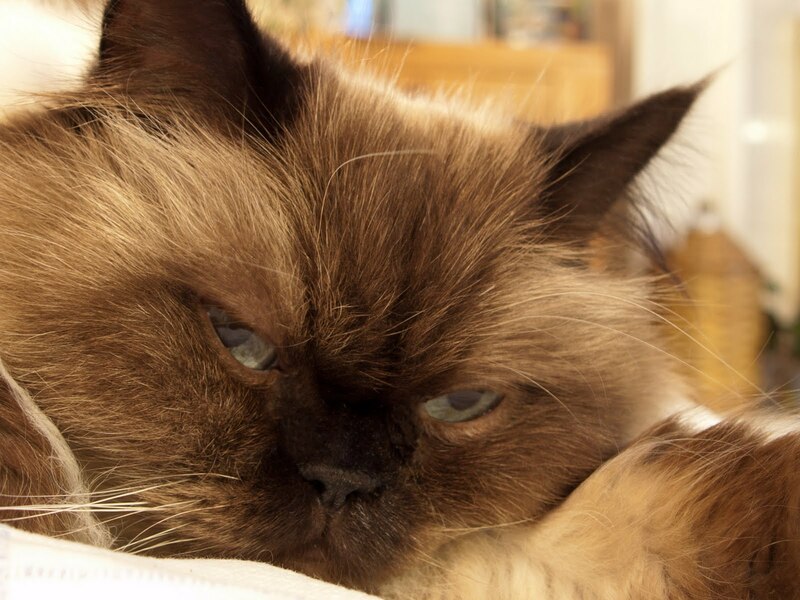 Be sure to check out Goma and Sachie (his owner)'s blog, My Himayalan Cat Goma. 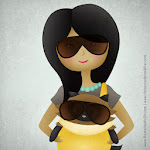 It'll make you smile, and you'll have it bookmarked in regular blog-rotation in no time! 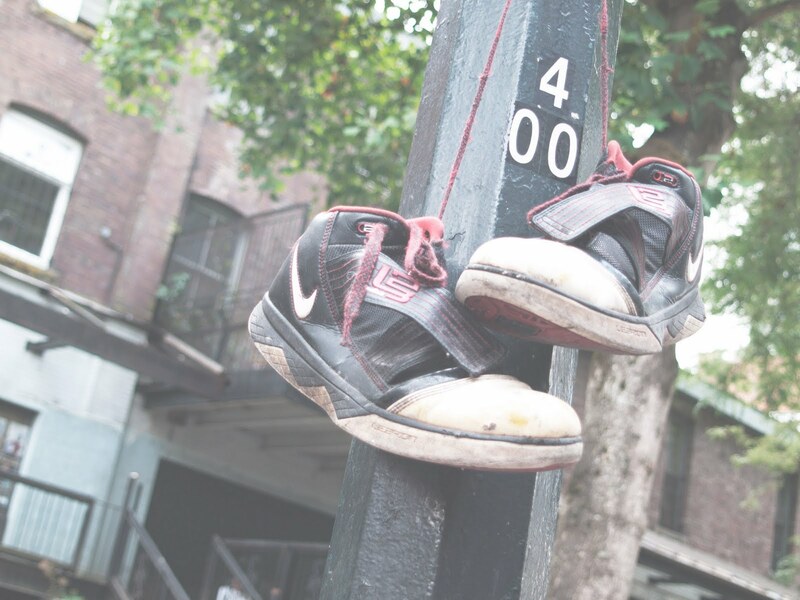 Photograph copyright © 2011 Jasmine Habart. 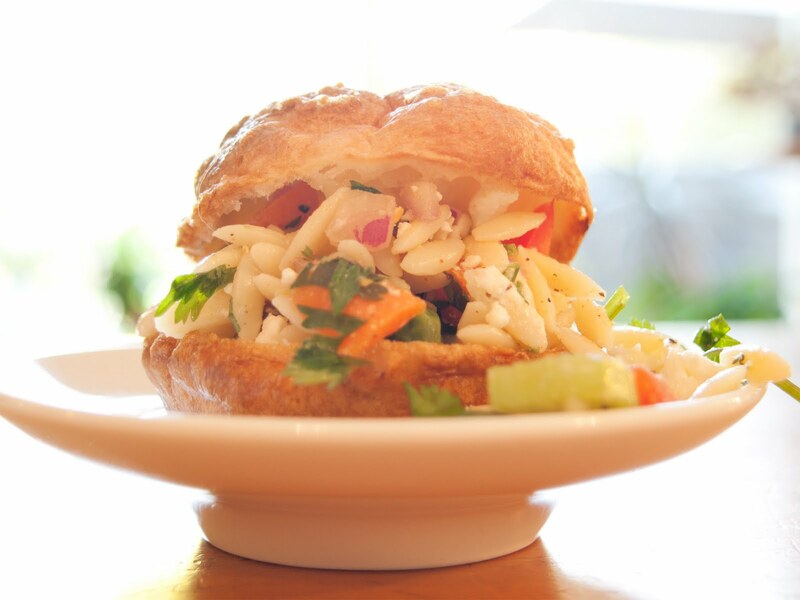 Leftover Yorkshire puddings + leftover orzo salad = bite-sized deliciousness! It was love at first sight when I saw a picture of this beautifully eclectic oven mitt in the October issue of House & Home magazine. After making a trip to Vancouver's new(ish) Anthropologie store, I was so disappointed when I couldn't find this set there. But wow, does that store have some incredible clothing and unique kitchenware! 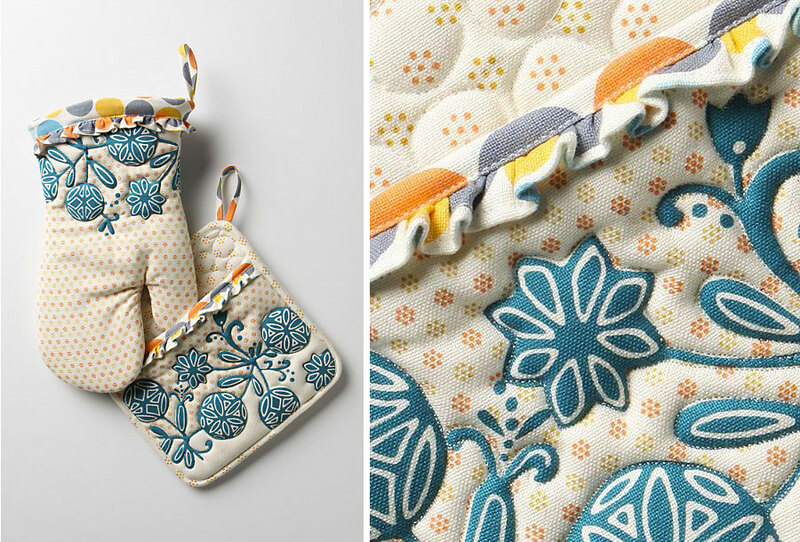 I love love love all the turquoise and yellow patterns! If the Bieb can go on Dancing With The Stars and sing a Christmas song, well then 'tis the season. 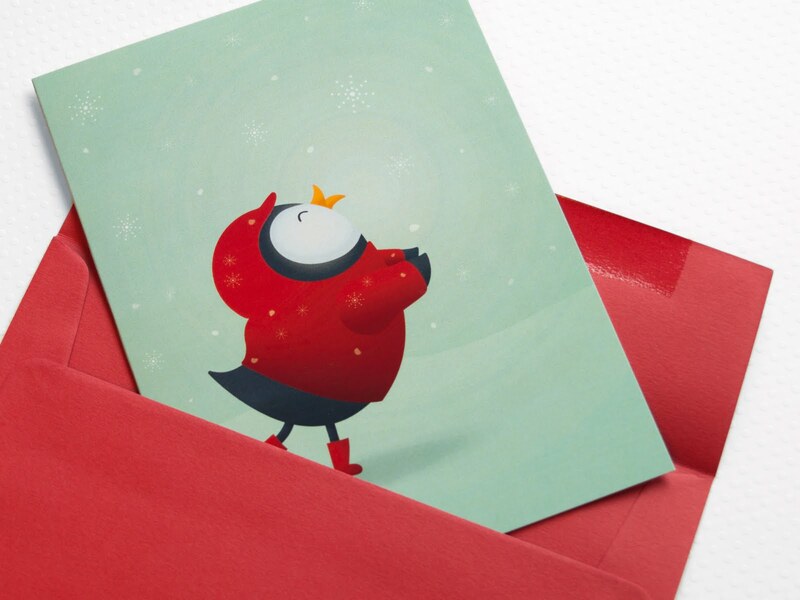 Here's to a very merry upcoming holiday season! 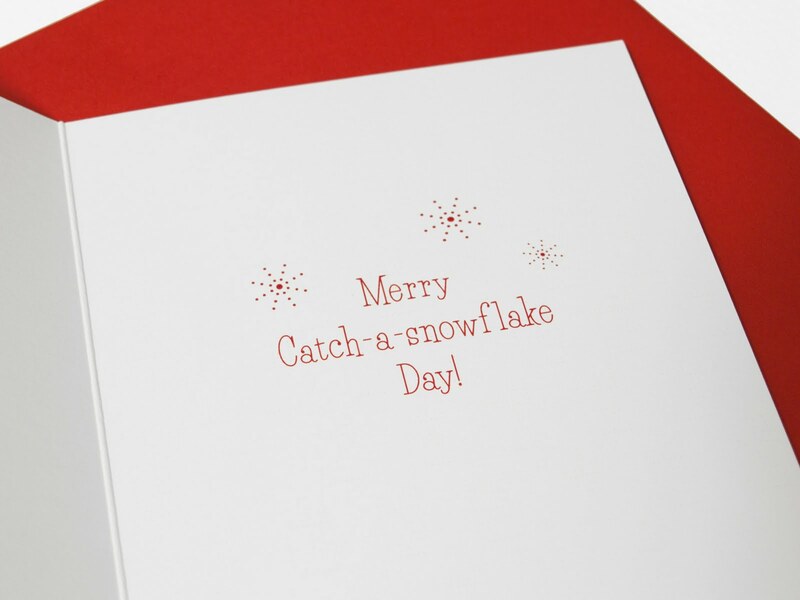 Stay tuned to see more of my Merry Catch-a-snowflake Day cards; or check out my Etsy shop, Happy Mine, where they'll soon be available! 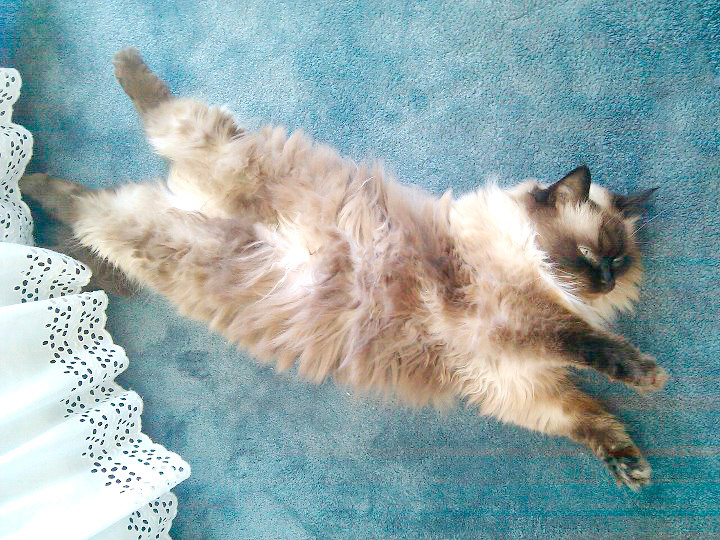 Simon says: Act just like Jasmine's cat. 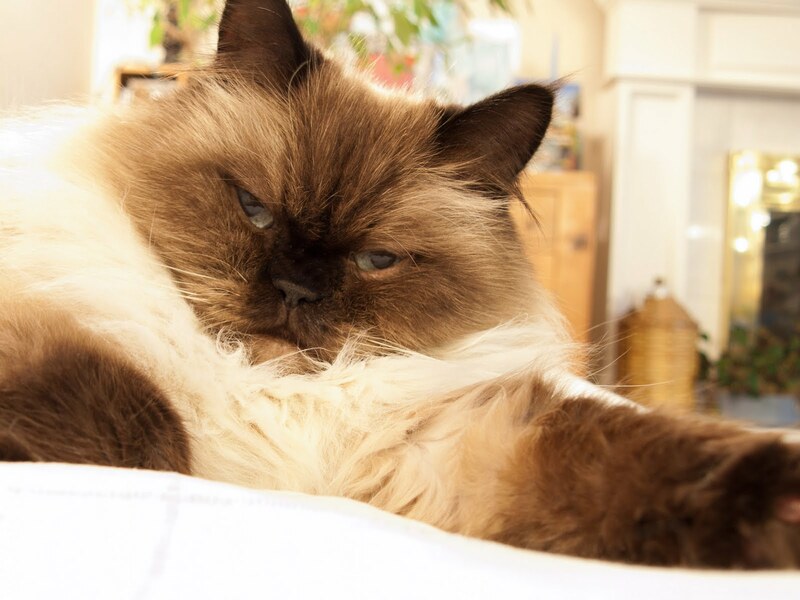 From the first film, Cat Man Do, Simon's Cat has reminded me of the heartwarming joys and frustrations of living with Mickey, my cute and cuddly yet ever so needy fluff ball of a cat. I love this film because it makes think back to all the all-nighters I pulled when I went back to school, and how Mickey would curl up beside me as I worked away until the early sunrise (at which point he would run like lightning to the kitchen to be fed). But like clockwork, at about 2am and 4am, he'd wake up full of energy, wanting to play and sit...everywhere...just like Simon's Cat. 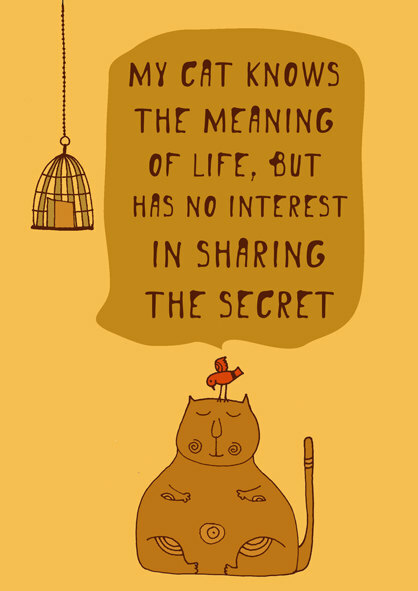 To see more of English animator, Simon Tofield's hilarious cat films, visit his website or YouTube channel. You wont regret it! Film from Simon's Cat YouTube channel. Indian naan bread is a thing of beauty. Cooked in a tandoor oven until it's golden brown and bubbly, it remains ever so soft and wonderfully chewy. Ripped into pieces, it's the perfect accompaniment — or utensil — to curries and rices. This naan bread, however, is not from a tandoor oven. Prepackaged from a regular old grocery store, it was not baked until light and fluffy. While soft and somewhat chewy, it's fairly dense and flavourless. So why am I writing about it? Because alas, Jamie Oliver has come up with a solution to store bought, semi-stale bread! 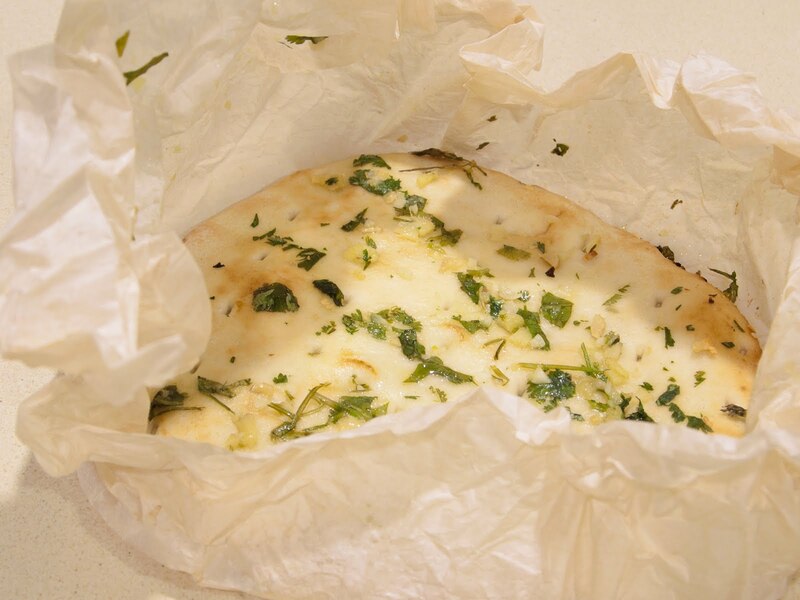 Using damp parchment paper, he brings his naan and ciabatta breads alike back to freshly-baked life. For kicked up naan bread, pre-heat the oven to 375°F (180°C). Scrunch up a large piece of parchment paper and run it under the tap. Lay it out flat, and drizzle with olive oil. Add herbs and spices for extra flavour (I mixed in freshly chopped garlic, ginger, and cilantro). Add naan breads and flip to coat each side with oil. Wrap the parchment around the naans, and place in the oven until heated through. Thanks to the damp parchment paper, the revived naans should be soft on the inside with a very slight crunch on the outside. 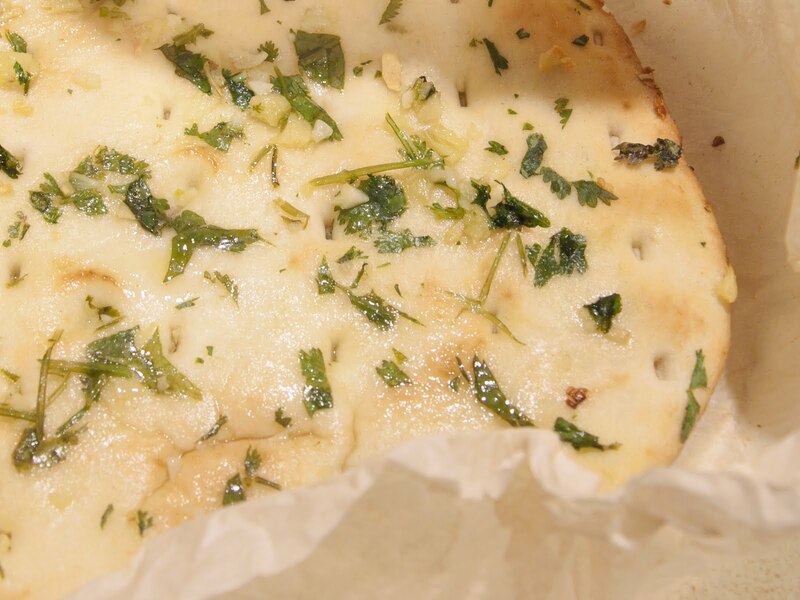 Almost...almost as good as authentic naan. If you're still not satisfied with the state of this naan bread, make a quick order to your favourite Indian restaurant. And use the rest of your "naan" to make personal-sized pizzas! Recipe from Jamie Oliver's website. Photographs copyright © 2011 Jasmine Habart. 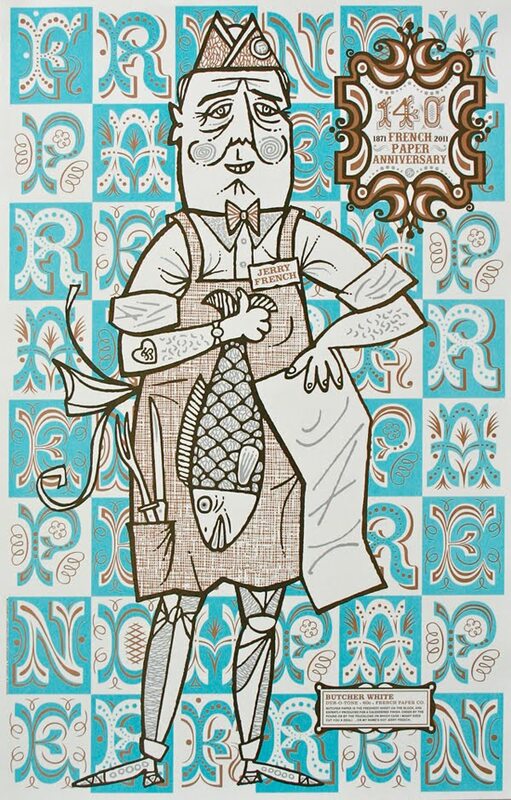 Dan Daniloff is a designer living in Riga, Latvia (the map tells me it's near Estonia!). 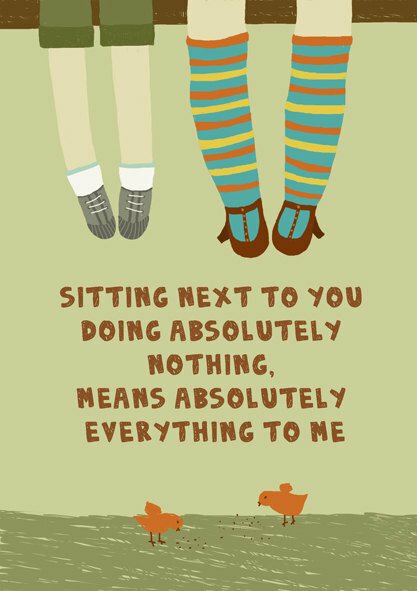 Remembering the quotes and sayings about love, life, and happiness that have inspired him and helped brighten his day, he shares them through the quirky illustrations he sells on Etsy. 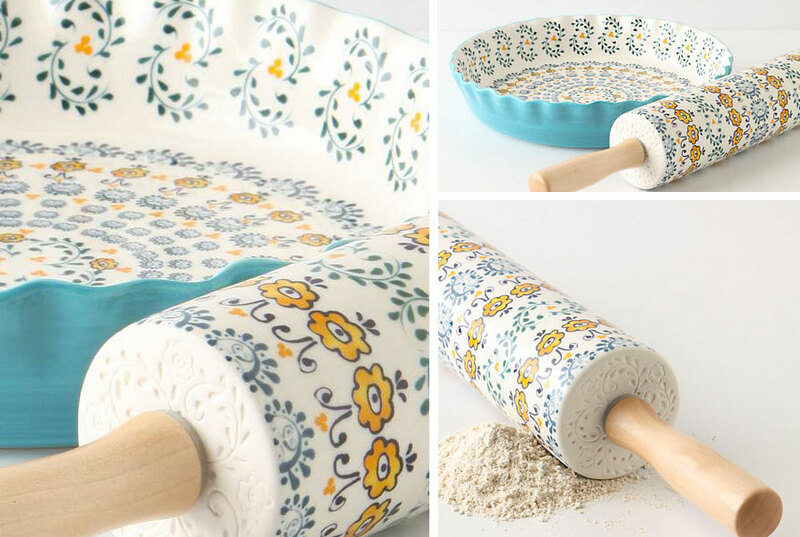 These prints were definitely designed to make the heart smile. 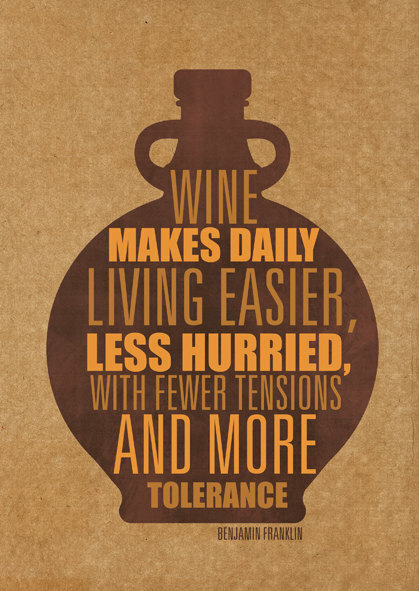 Purchase Dan Daniloff's Wine makes daily living easier, less hurried....., Sitting next to you doing absolutely nothing....., My cat knows the meaning of life...., and other feel good goodies here. All artwork from Dan Daniloff's Etsy shop, Gayana. I am completely inspired by these amazing prints by Portland-based artist and illustrator, Mary Kate McDevitt. 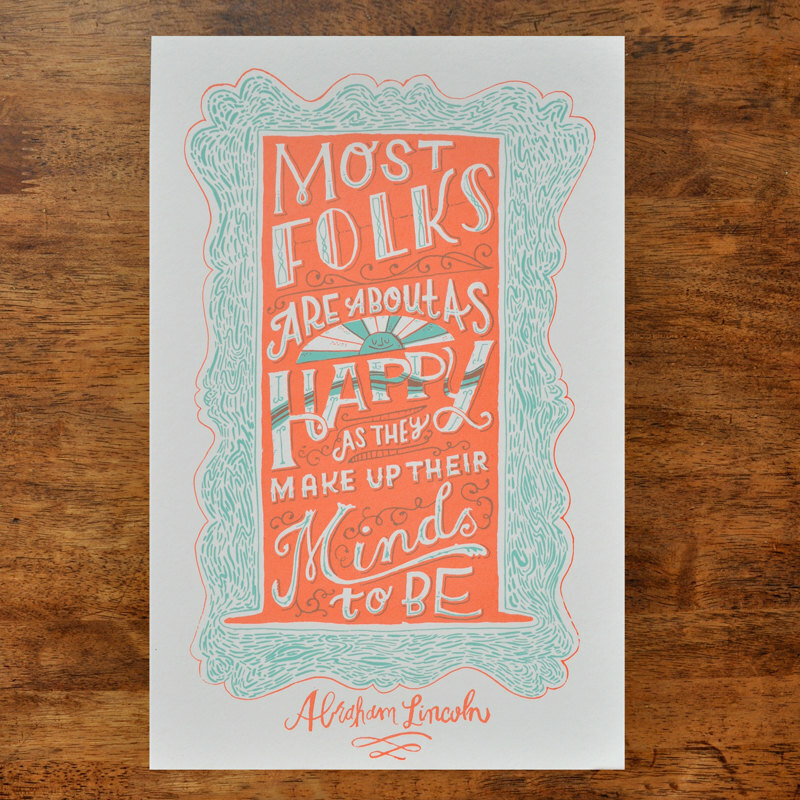 Their words convey so much beauty not only through their messages, but through their unique hand lettering as well. With such wonderful daily inspiration, these prints would brighten up any room! 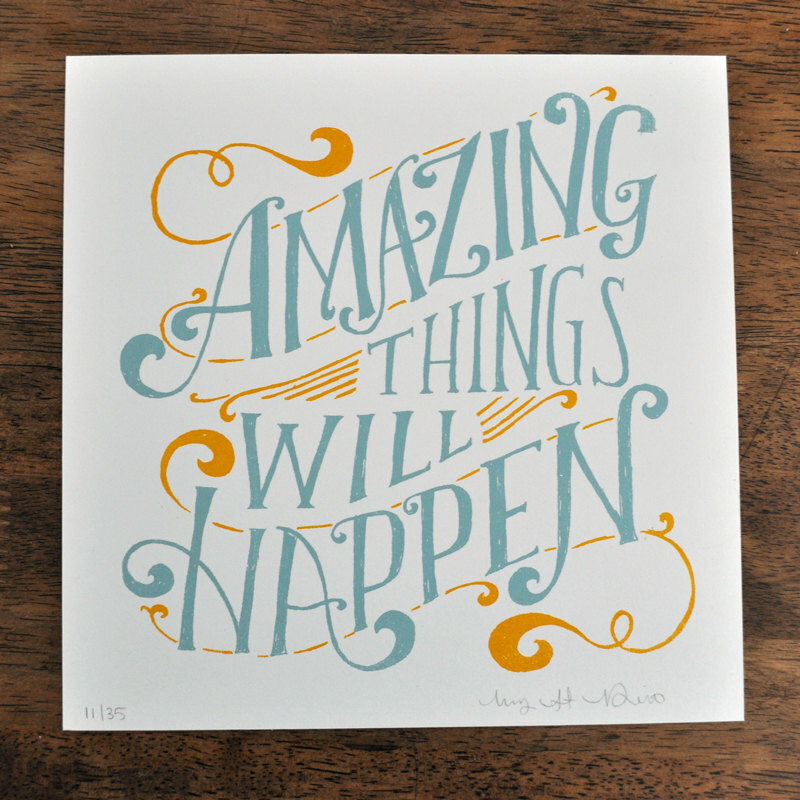 Purchase Mary Kate McDevitt's Amazing Things Will Happen, Abe Lincoln Quote and other lovely hand lettered goodies here. Or visit her website for more information. Photographs from Mary Kate McDevitt's Etsy shop. Cable Knit Reading Shawl - Feather Grey from Indigo. Cable Knit Reading Shawl - Linen from Indigo. What a multitasker. 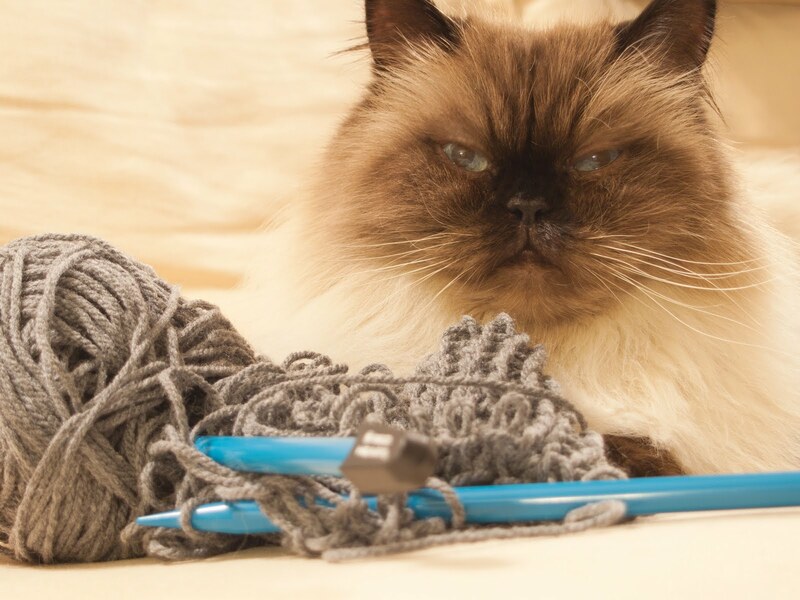 Not only is Gus working on some knitting, but he's also perfecting his ability to blend his fluff directly into the couch. Way to Barbapapa into your own seat, Gus! That's right, macaroni and pureed squash! Okay, there's a bit of cheese mixed in and sprinkled on top, but only about half a cup as opposed to...oh, I don't know, an entire brick? 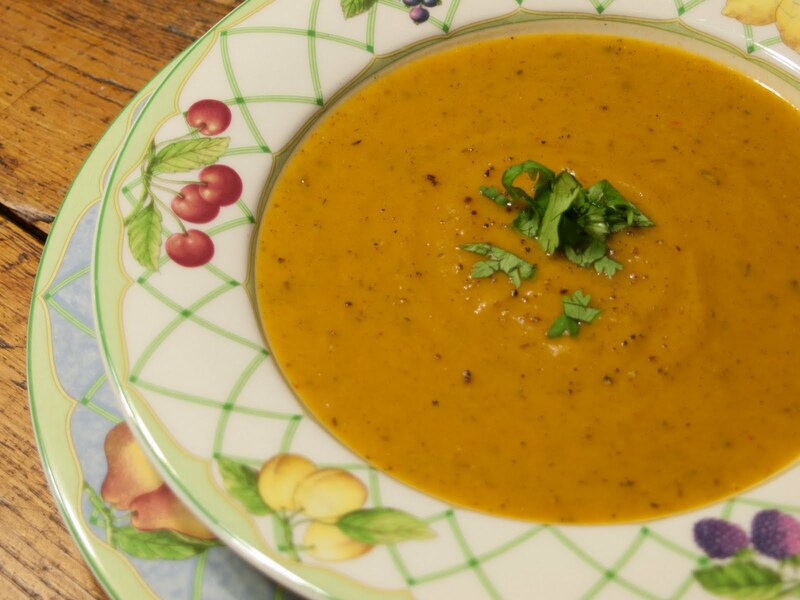 For this recipe I used brown rice macaroni*, acorn squash soup (an ever present leftover during the holiday harvest season! ), and grated Parmigiano-Reggiano cheese. I got the idea for this concoction the last time I made acorn squash soup (using this recipe, substituting acorn for butternut squash). Completely dairy-free, I couldn't believe how rich and creamy it was; and when I tossed in a handful of leftover macaroni, the soup clung to the pasta and became more of a hearty sauce than a simple soup. 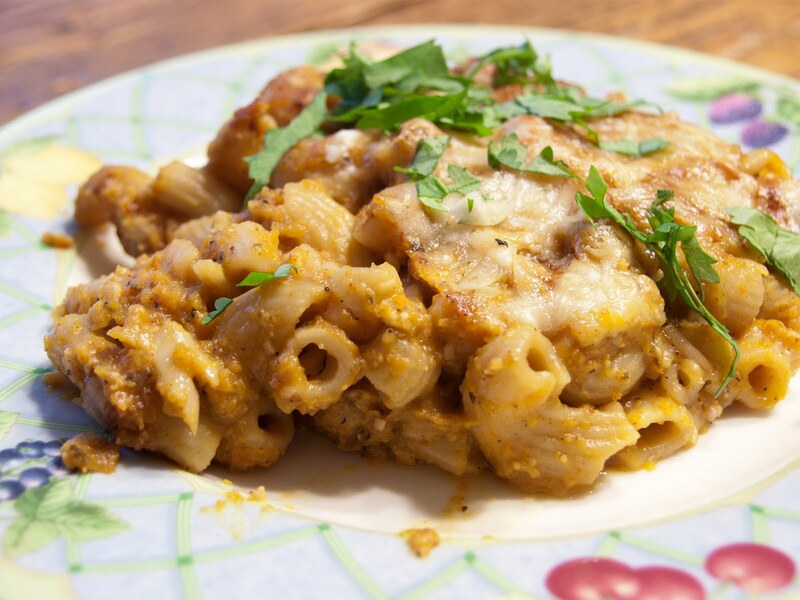 The texture was just like homemade macaroni and cheese! All that was missing was that crunchy top layer of rich melted cheese. So if you happen to have a batch of leftover squash soup in the fridge, preheat oven to 350° F (175° C). Cook up some macaroni (I used about 1 cup of dried brown rice elbow noodles*), drain, and add back to cooking pot. Next, ladle in enough leftover squash soup to generously coat the pasta (I used about 2 cups). Mix in about a quarter cup of freshly grated Parmigiano-Reggiano cheese and a few pinches of chili power, paprika, and nutmeg. Once heated through, pour the gooey mixture into a baking dish and sprinkle with another quarter cup of cheese. Bake for 15 minutes or until cheese is bubbly and golden brown. 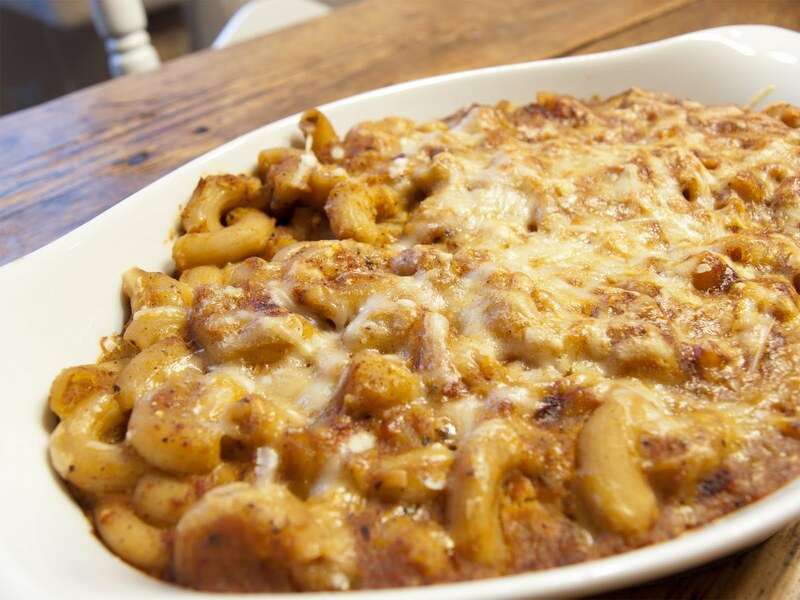 It will look just like your typical homemade mac and cheese, and it will be eaten up just as quickly! The best part about this dish? The sauce is basically all veggies, so no side dish—or guilty feelings—required! And just in time for Canadian Thanksgiving, you could add some leftover turkey to the mix. Ou, or some stuffing. Or spread leftover mashed potatoes on top...wait, that's just crazy!! Crazy delicious. 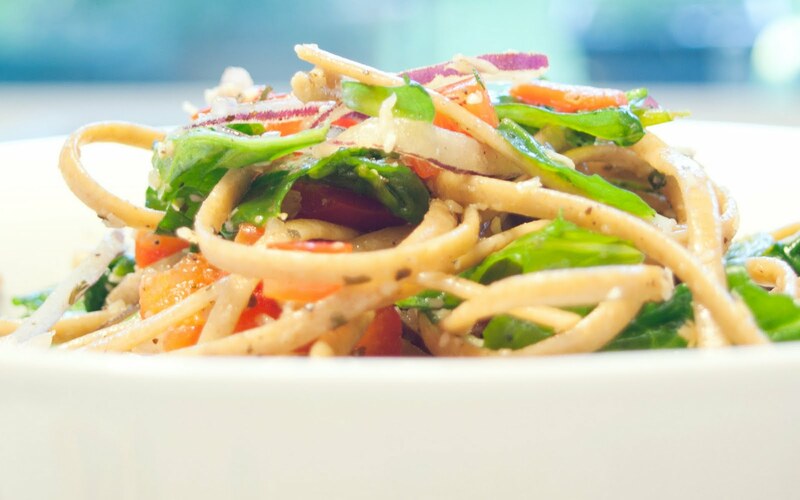 *PS: brown rice noodles are great because they're less likely to overcook and get all soggy when baking in the oven! 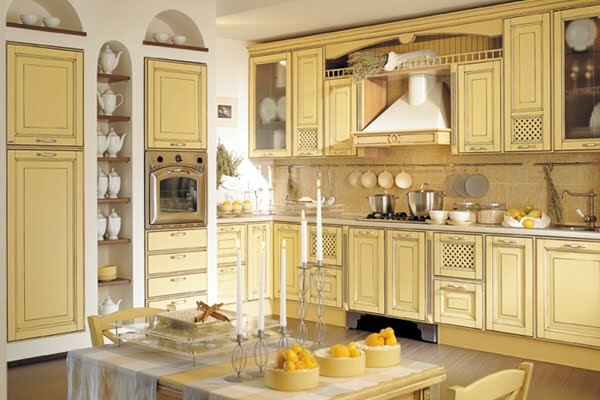 Beautiful kitchens make the heart smile, especially those inspired by old world Italy and France. Bright and open yet warm and rustic, I love this vintage kitchen design! 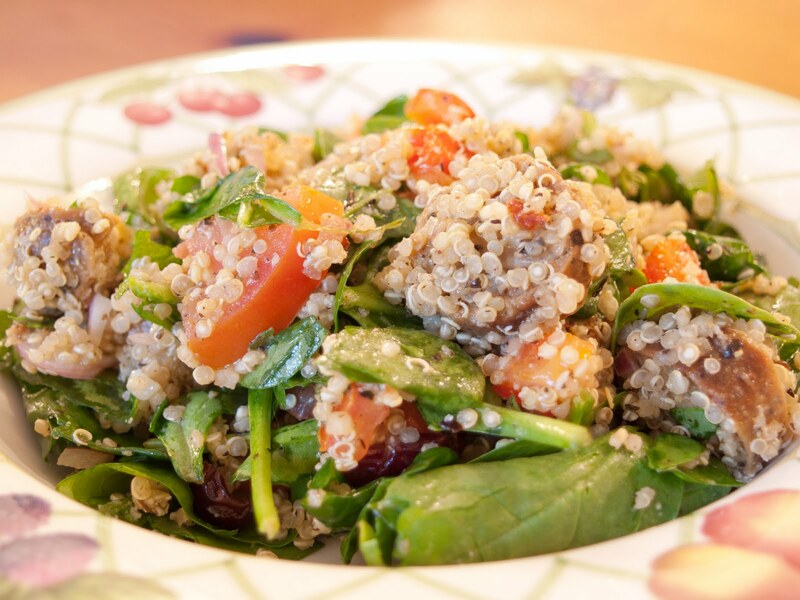 Craving something hearty but not too heavy for dinner last night, I decided to whip up a giant batch of quinoa. Then with a sudden craving for my warm pasta toss with spinach and sausage, I fried up some veggie sausages and replaced the whole grain linguine with 2 cups of cooked quinoa. The result? A lighter meal with the exact same taste; and still filling and oh so satisfying! When it comes to beautiful branding and packaging, this project definitely makes my heart skip a beat. 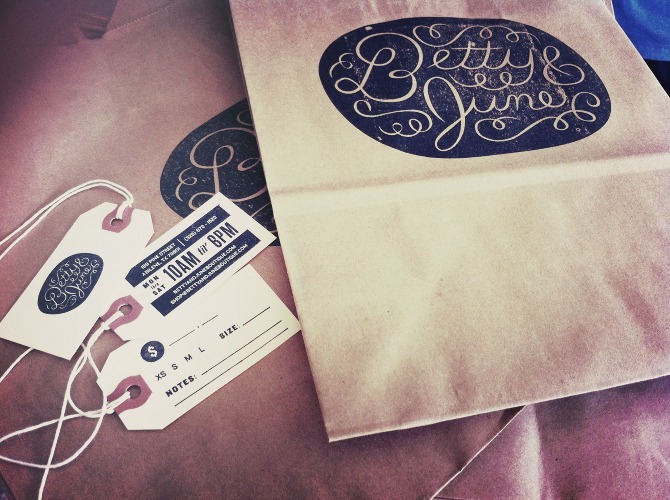 Designed by Ryan Feerer for a local shop in Abilene, Texas; every bag, tag, and business card was hand stamped for added character. 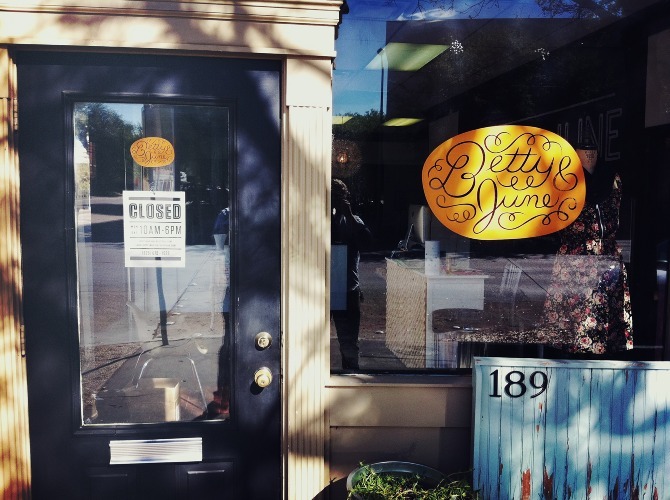 What a smart way to showcase a unique and ever-changing local boutique! 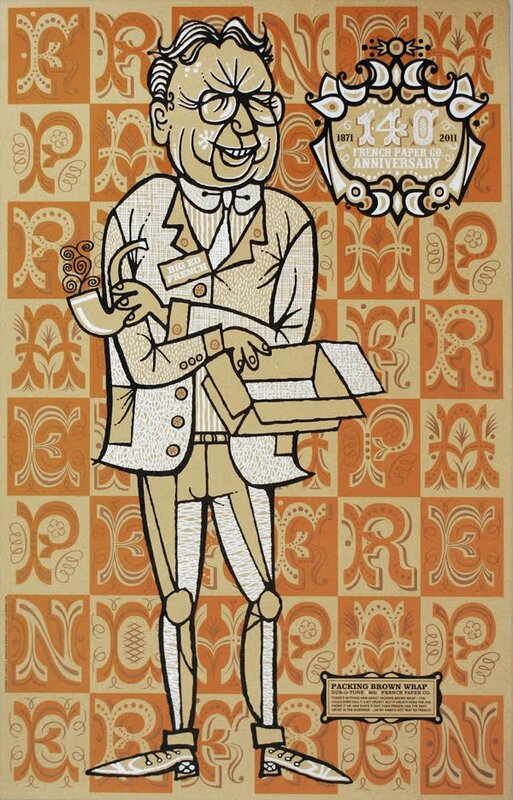 For more information of Ryan Feerer, visit the very talented designer and illustrator's website. Photographs from Ryan Feerer's website. I bought my first box of mini mandarin oranges the other day, and they're delicious! Juicy and refreshing, I'm sure they'll all be gone in a few days. 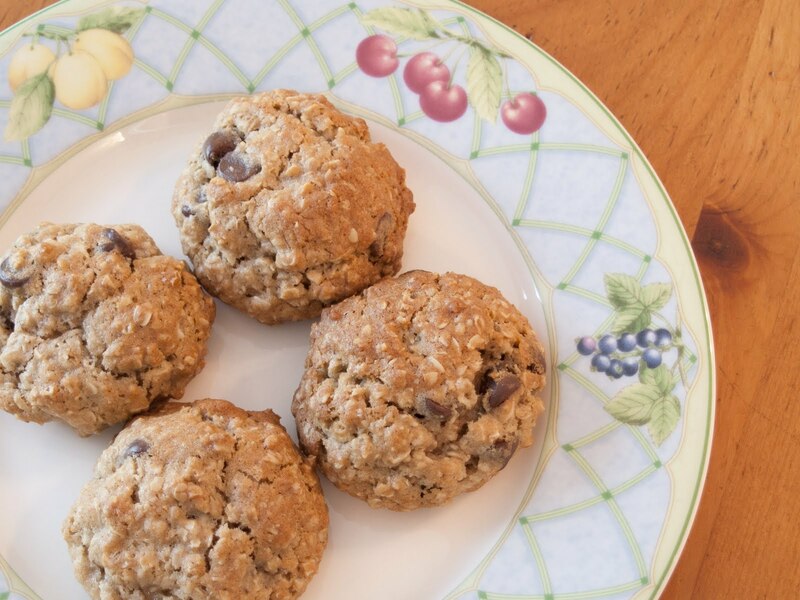 What's better than freshly baked homemade oatmeal chocolate chip cookies? Full of warm gooey chocolate on the inside and a slight crunch on the outside; the smell of buttery dough filling up the house; the way they melt into vanilla ice cream...yum! Never settle for dozens of stale cookies when they can be baked fresh every time. 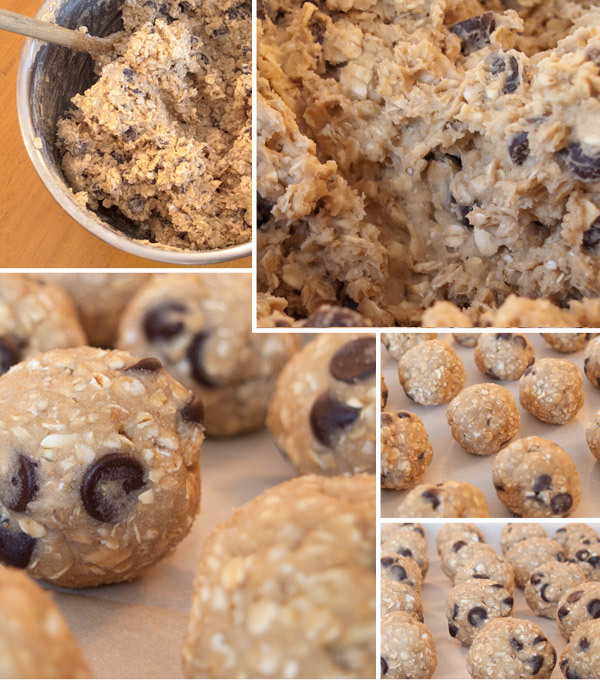 Simply mix up a batch of dough, roll it into balls, arrange on a baking sheet, and let set in the freezer. 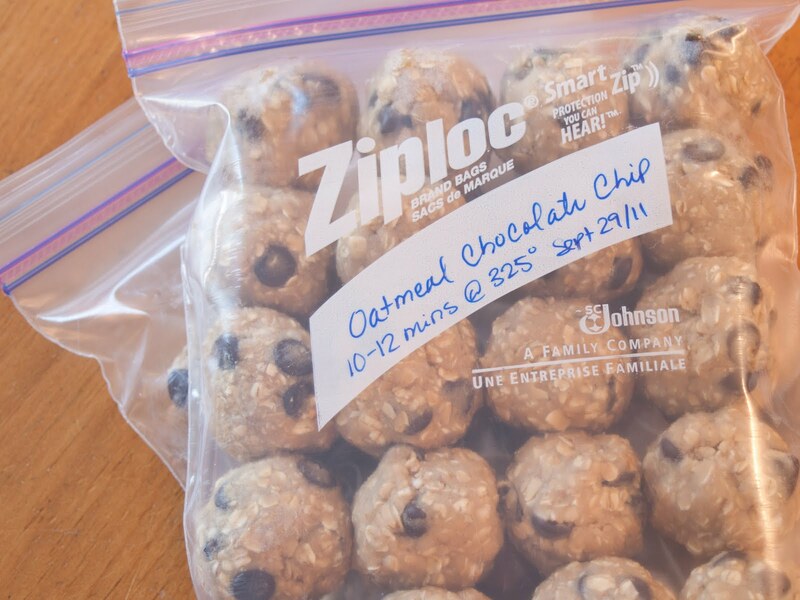 Once frozen, store cookie dough in airtight freezer bags. Label with baking instructions and keep frozen until your next sugar craving. A great thing about freezing this dough is that it makes the cookies hold their shape as they bake. Don't even bother defrosting them; just pop the frozen dough onto a parchment-lined baking sheet and into a pre-heated oven. 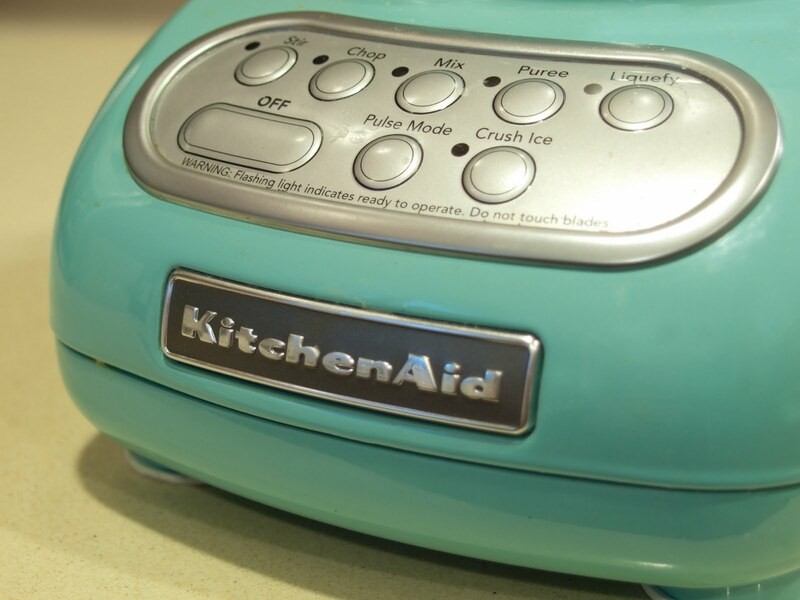 I use the toaster oven for small or individual batches. 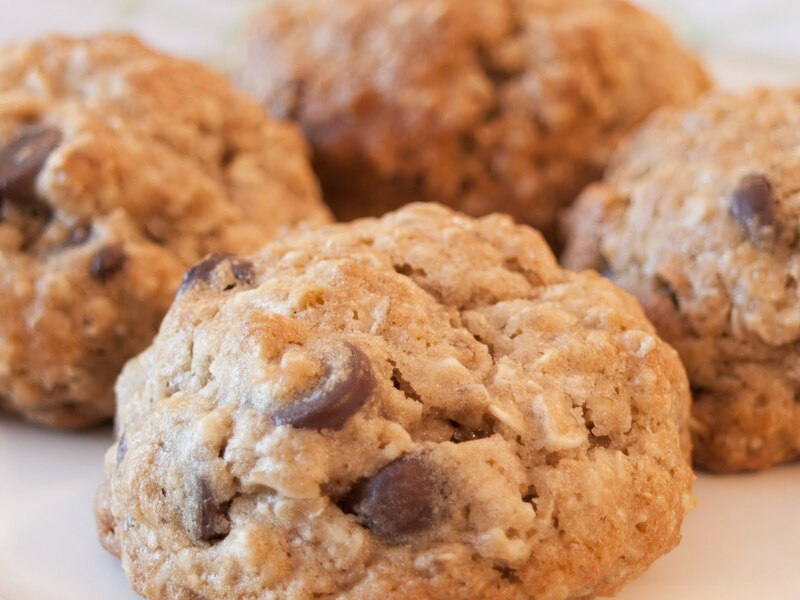 For these chewy oatmeal chocolate chip cookies, this is my absolute favourite recipe! Sometimes I add cinnamon and raisins to the mix, and I always make sure to chill the dough before baking it. Pressed for space? How about converting an empty closet into a mini office area. While this isn't for everyone, it's a cute idea if you have the extra storage space. It would make for an easy way to hide that messy desk when guests come over, too! 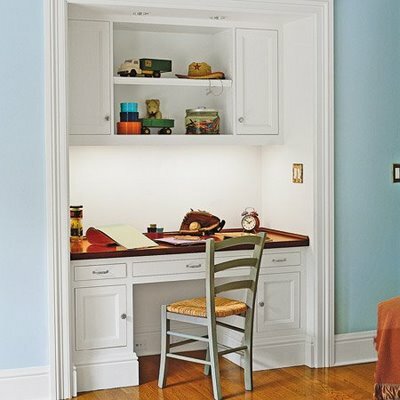 Remove the closet doors, and it's a simple way to get the look of a desk that's built right into the wall. How HGTV! Bottom photograph via The Ringls. The autumn squash season is upon us, which is ever apparent by the overflowing bins of acorn and butternut squash varieties that have beautifully decorated the entrances to grocery stores for the past few weeks. I decided to take advantage of the fall harvest by whipping up some homemade soup. 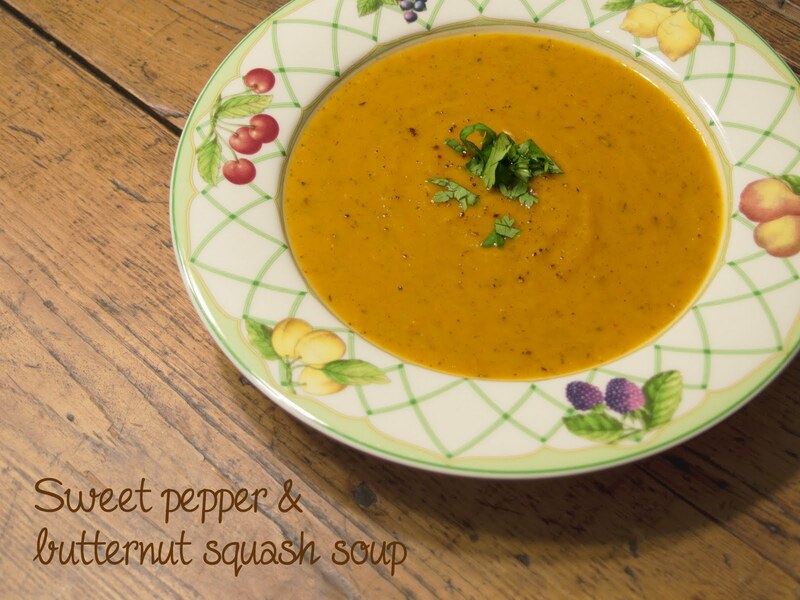 This sweet pepper and butternut squash soup is rich and creamy, yet completely lactose-free. The recipe I used is from the Chatelaine website. I substituted a red pepper for an orange pepper and used vegetable stock instead of chicken broth. I also added a dash of cinnamon and freshly grated nutmeg to the puréed soup. Mmmmm, soup. Preheat oven to 450°F (230°C). 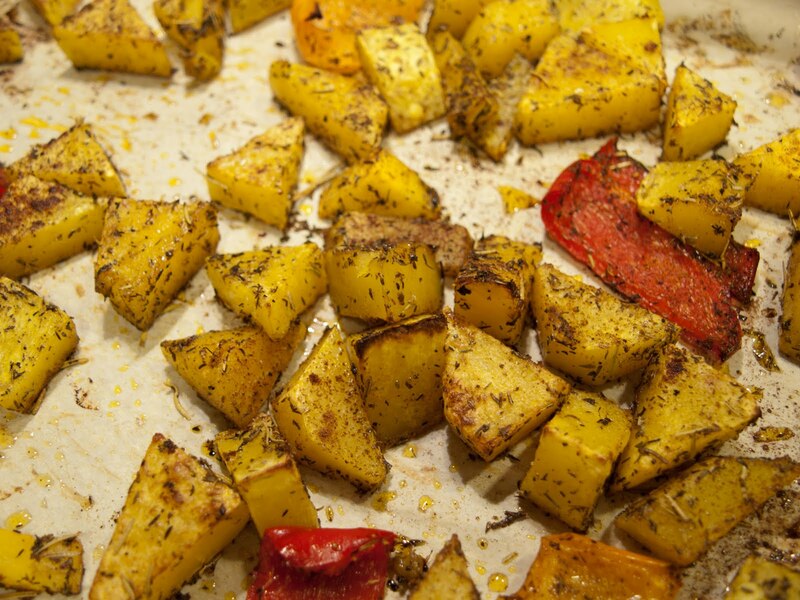 On a large baking sheet, toss squash and bell pepper pieces with rosemary, thyme, salt and pepper, cayenne, and enough olive oil to coat. Arrange in a single layer and roast until tender, about 30 minutes, stirring halfway through. When the veggies are almost cooked, sauté onion and garlic with oil in a large pot over medium heat until tender, about 5 minutes. Next, add roasted vegetables and broth to pot and stir. Purée soup using an emulsion blender or stand blender. I've learned a great many things from watching the Food network; one of which is that when puréeing hot liquid in a stand blender, it's important to blend small quantities and hold the lid down tight! So purée soup in two batches, and use a kitchen towel to help hold the lid on without burning your hand. If using a stand blender, return puréed soup to pot. Add cinnamon and nutmeg, and keep soup warm until ready to serve. Delicious! 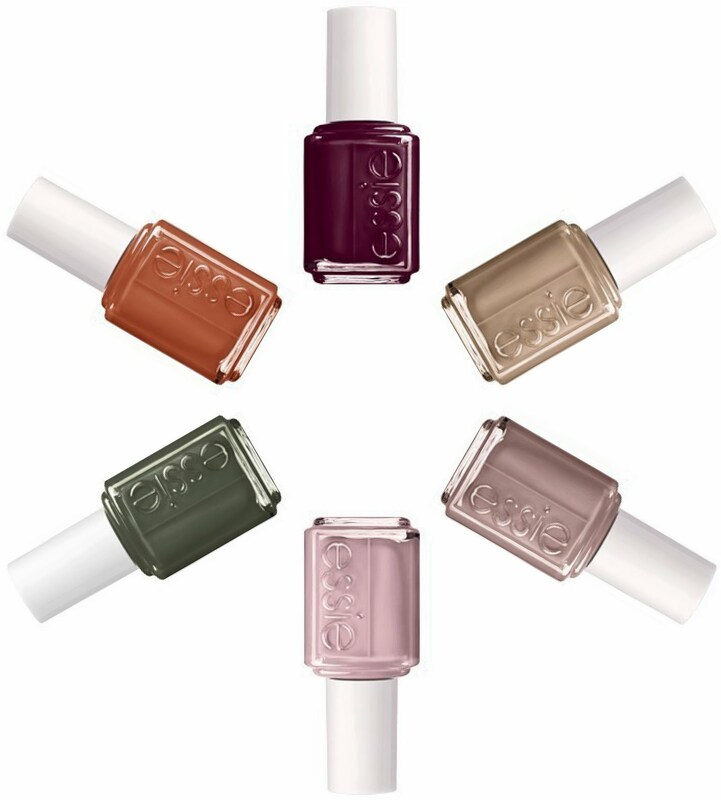 Wear your heart on your sleeve, and keep your feelings at your fingertips with Essie's new fall collection of gorgeous nail colours. What colour are you today? 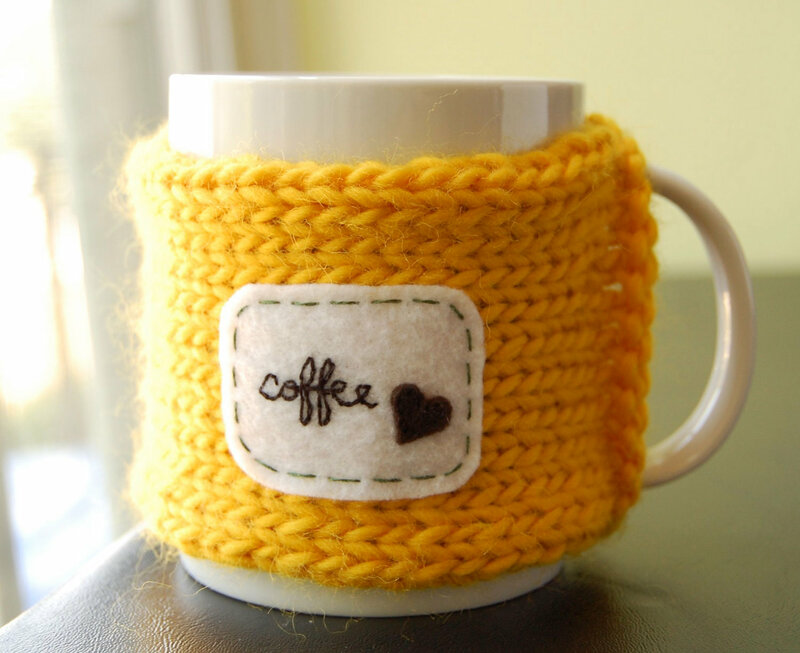 I ♥ this coffee cozy almost as much as I ♥ my daily cup of joe. Originally designed and knit-to-order by Katy Reiser, this sunshine cozy is available through the artist's Etsy shop, KnitStorm. Photograph from KnitStorm's Etsy shop. Flipping through the September issue of Chatelaine, I couldn't help but stop and stare at this mouth-watering photograph by Michael Alberstat. Just like the syrup that drizzles over the pancakes, the rich colours ooze with feelings of warmth and comfort. The gluten-free buckwheat pancakes look incredibly light and fluffy yet rustic, hearty, and oh so satisfying! Breakfast for dinner, anyone? See more of Alberstat's beautiful photography in the September issue of Chatelaine. 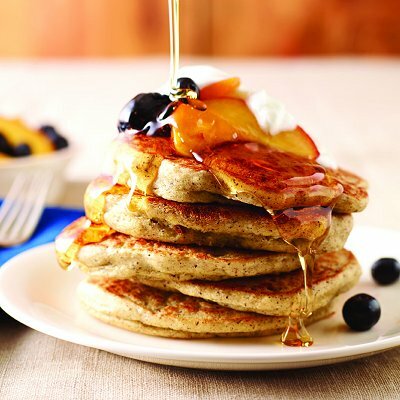 Flip to page 146 for more gluten-free ideas, and get the recipe for these buckwheat pancakes on page 173 or online here. Photograph for Chatelaine. Photography by Michael Alberstat. Food Styling by David Grenier. Prop styling by Julia Black. Photograph from Chatelaine. Is this even a real cat? Halloween is fast approaching, and the big-boned pug is getting ready! You know, if he can't pull off that costume then who can? 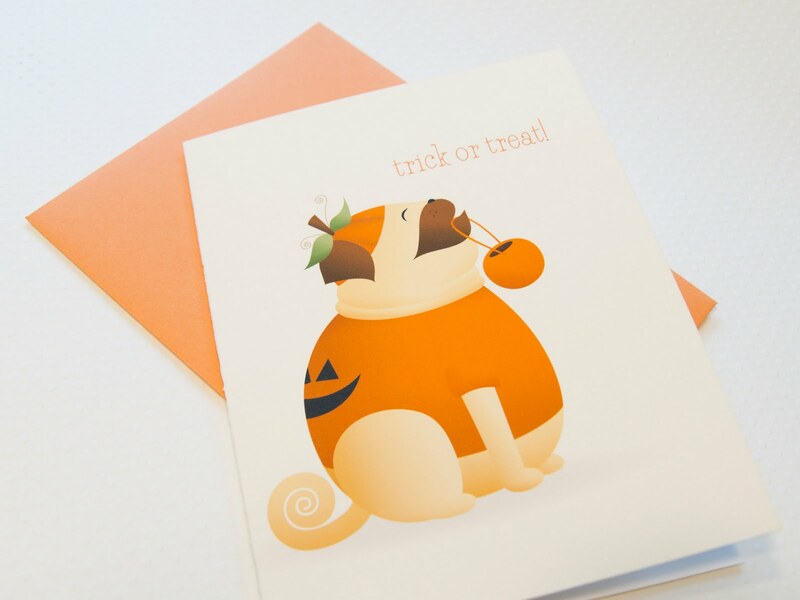 To get your paws on your very own big-boned pug greeting card, visit my etsy shop: Happy Mine. 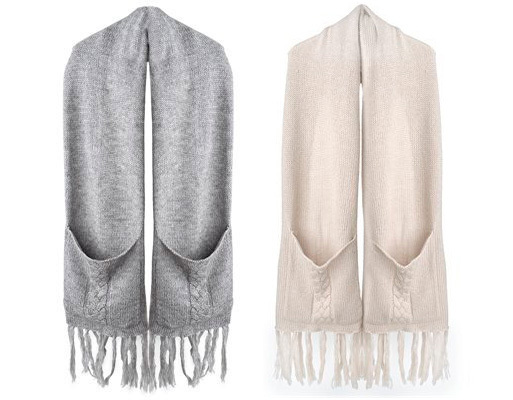 As summer turns to fall, the weather gets cooler and the days get shorter. We reach to backs of our closets for the sweaters and blankets that we packed away last spring. 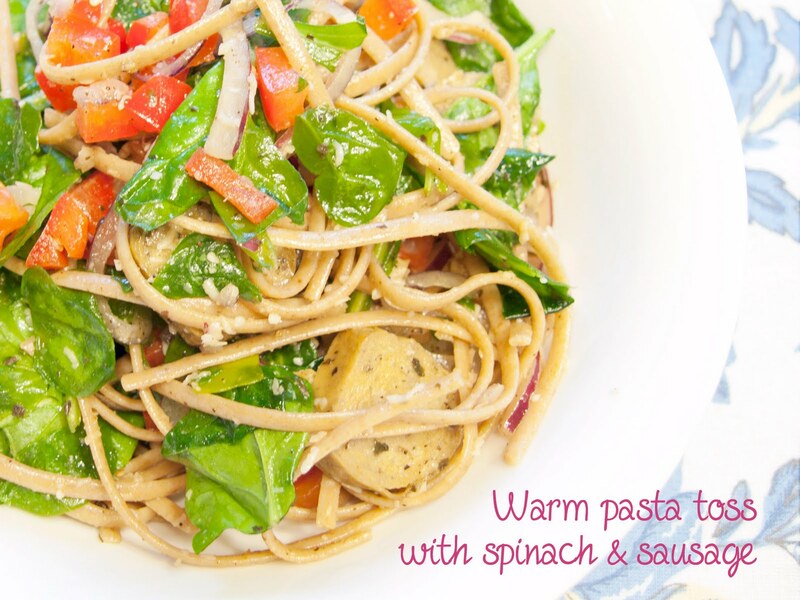 What better way to usher in the new season than with this warm pasta toss with spinach and sausage! It's hearty yet fresh, and it takes advantage of some of the late summer's in-season produce. I found this recipe near the top of my mom's folder for pasta/rice dishes. I don't know how old it is or where it came from, but I definitely remember twirling forkfuls of leftovers into bowl after bowl way over a decade ago. I used veggie sausages, and it turned out just as delicious as I remember it being. Cook pasta according to package directions, or until al dente. Meanwhile, heat 2 tablespoons oil in a large pan. Add sausage and cook over medium heat until lightly browned. Stir in remaining oil, garlic, and herbs. Reduce heat to low and simmer until sausages are cooked. Slice sausages into bite-sized pieces and set aside. 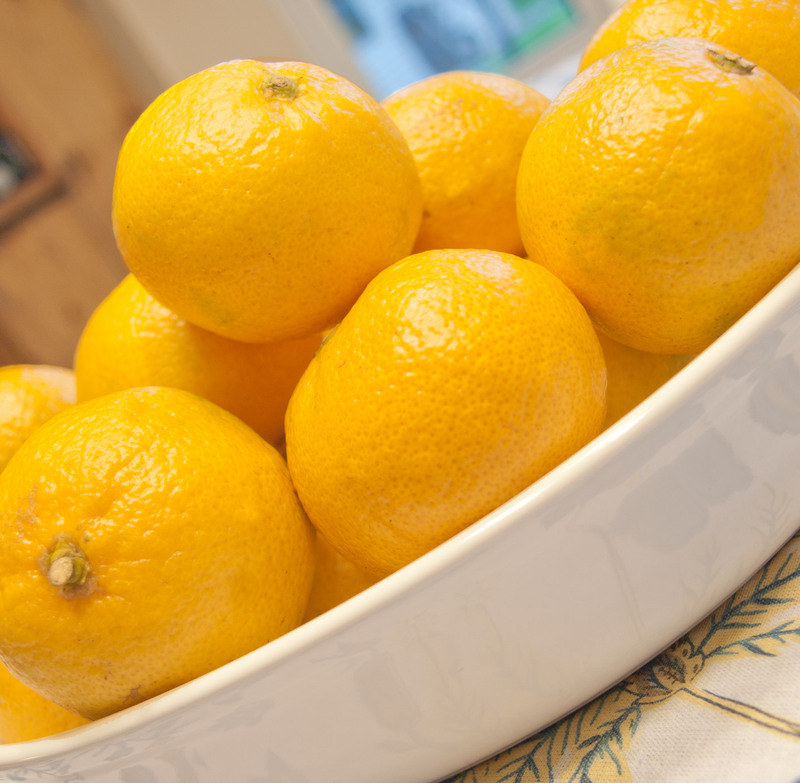 Scrape pan drippings into a large bowl, and whisk in vinegar. Add drained pasta and mix well. Add remaining ingredients (sliced sausages, tomatoes, red bell pepper, onion, spinach, and Parmesan) to warm pasta, and toss. Serve warm or as a cold salad. 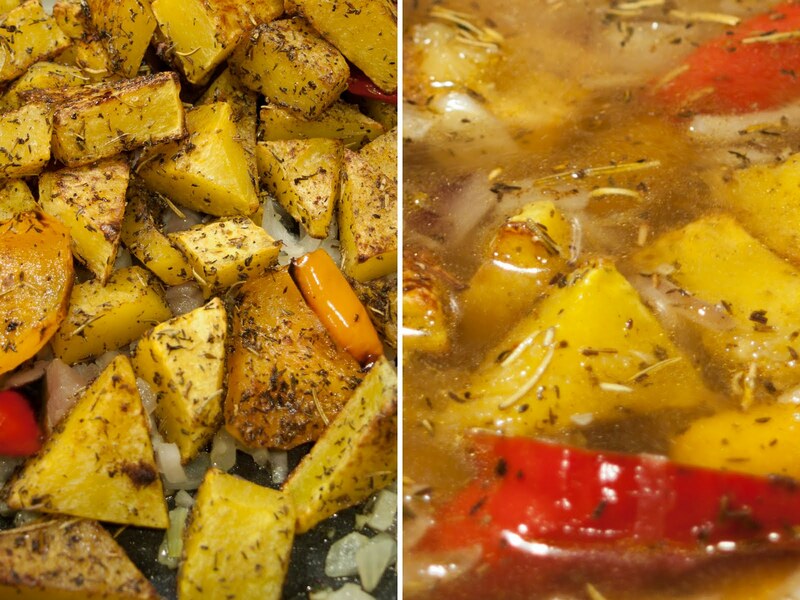 Either way, this dish is delicious, nutritious, and incredibly satisfying! It's that time of year again... Hang up those old kicks and break out your new pre-fall wardrobe. It's back-to-school week! Well, I'm not going back, but I'm wishing all of you students a wonderful/exciting/non-terrifying first day! 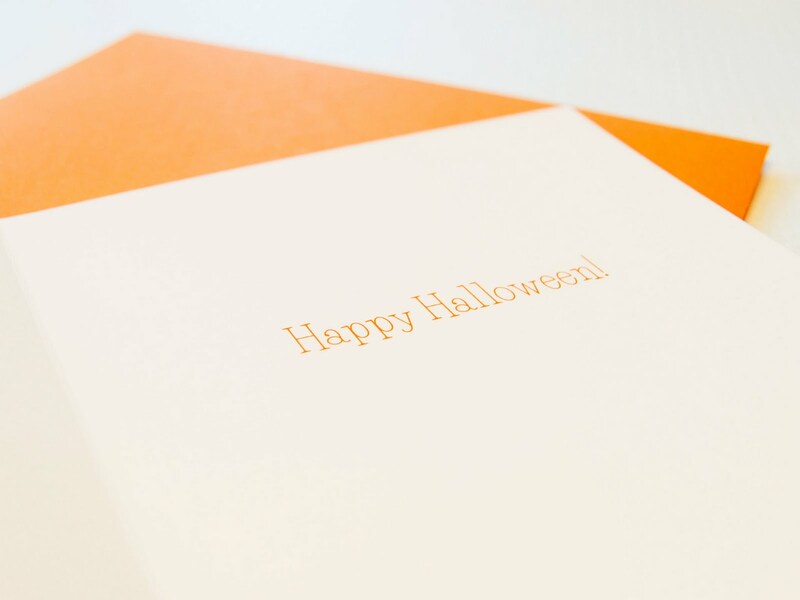 The campaign was design by the über inspiring Charles S. Anderson Design, who celebrates 25 years of working with French Paper Company. 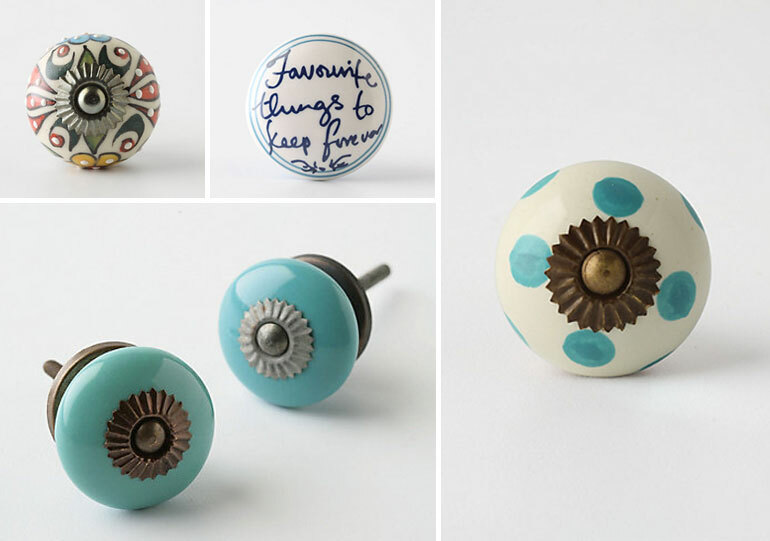 Their retro-looking patterns, colours, and illustrative lettering truly make the heart smile. 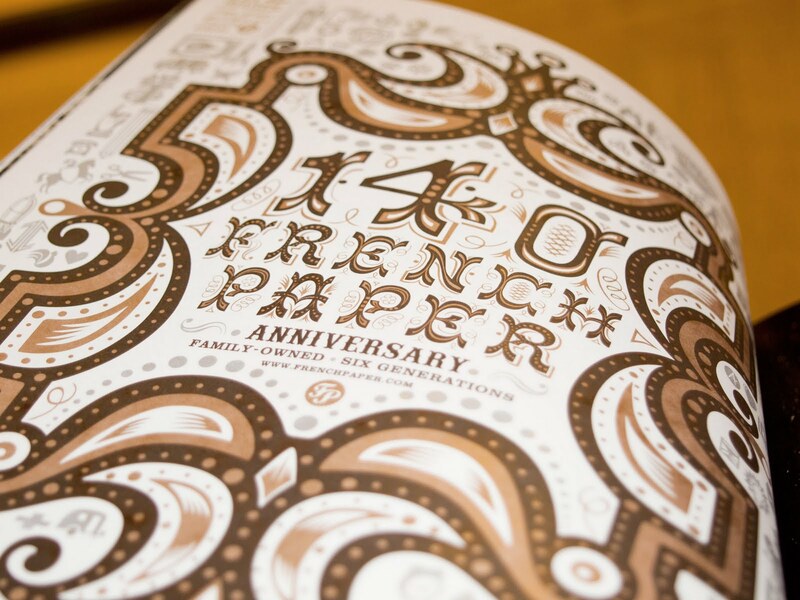 For more information on this extraordinary print campaign, visit French Paper Company or CSA Design. 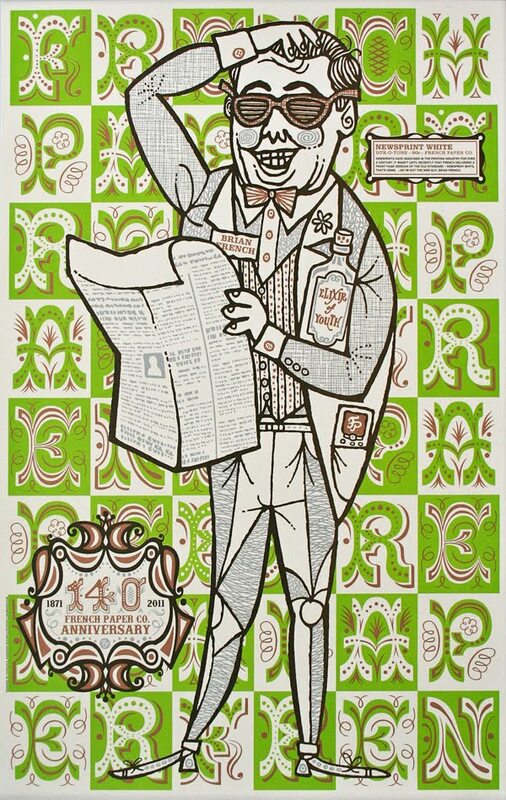 Artwork from French Paper Sample Room.